I caught about an 18-inch channel cat this evening. It looked like it had swallowed a tennis ball. This is what I found inside when I fileted it. Never seen that. Neat pic. I've noticed the frogs at my place laying really still on the bottom in the shallows. I bet that channel was taking advantage of the cooling metabolisms. So...how did you fix them? Cornmeal and deep fry next to the filets?? I suspect my SMB in my RES/SMB pond chowed down on frogs earlier in the season. 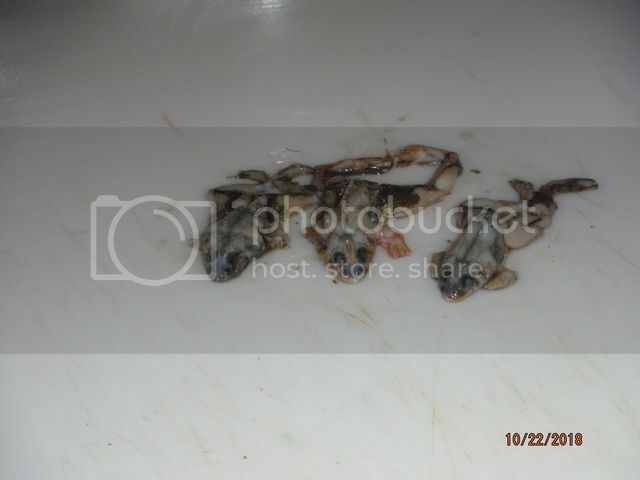 At one time I had what looked like thousands of bullfrog tadpoles. Then they turned to frogs and when I went around the pond frogs were jumping in in droves. Then they thinned. Now I only see a few. I suspect they were just the right size for my largest SMB to chow down on. I put them in a baggie that I set out in the sun this morning. I'm heading to Lincoln, NE late next week, and may bring them as a gift if I can get them through security. If not, I'll save them as a delicacy for Sunil and Rainman next time we get to go fishing together again! I miss my crazy Pond Boss friends! Ken call me before you head into Lincoln, let's connect. I'll pm you.